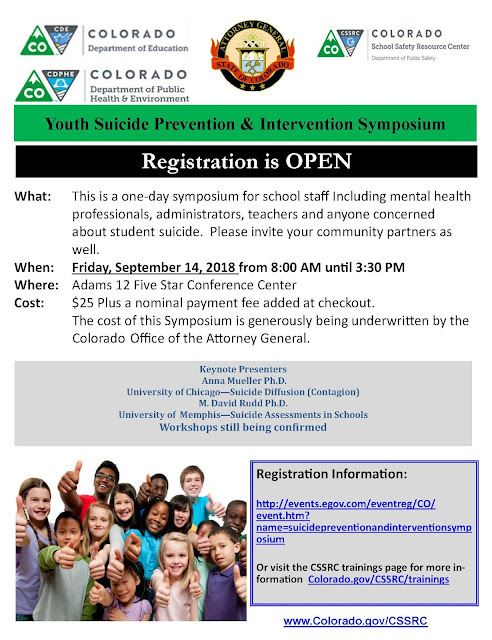 Colorado Child Fatality Prevention System: OPPORTUNITY: Youth Suicide Prevention Symposium Registration and call for proposals! OPPORTUNITY: Youth Suicide Prevention Symposium Registration and call for proposals! Prevention – this might include programs and strategies schools can use with students, staff or parents in elementary, middle and/or high school to prevent suicide. Evidence based programs are preferred. Intervention/Assessment – this might include protocols and procedures used in your school to assess possible suicidal ideation and intervention procedures once a student has been found to have suicidal thoughts. Postvention – this might include how a school responds after a student has made an attempt and/or after a student or staff member has died by suicide. Schools are particularly interested in procedures that lessen the chance of contagion. Typically our audience for suicide workshops have included school mental health professionals but we would like workshops to appeal to administrators, teachers, community mental health providers and emergency responders that work with our schools. For more information about submitting proposals, click here.